To market its webinar, InsightSquared went the extra mile. It bought 248 copies of the presenter’s book. The author autographed the books with an invitation to attend the webinar. Each one included a bookmark with a URL to register. Then, the company targeted everybody who visited its website with the same domain as an invitee. Webinar day arrived. Six people attended. A complete content marketing disaster. But at the end of the quarter, the book-invitation webinar campaign was the most effective one to influence the deals that got done. How did a content marketing calamity turn into a big sales success? That’s how Joe Chernov, vice president of marketing at InsightSquared, explains it in his session Account-Based Marketing vs. Content Marketing: Friend or Foe? at Content Marketing World 2016. “Content marketing leaves off at a certain point, but business goals go a little beyond that,” Joe says. Account-based marketing can fill in those gaps. InsightSquared combined content marketing and account-based marketing for its webinar-focused campaign. “We confused people. We gave the reps an excuse to call to un-confuse people,” Joe says, noting that a sales rep on the phone with a potential customer is a big win in the sales process. Joe argues that the choice for marketers is not an either-or proposition. 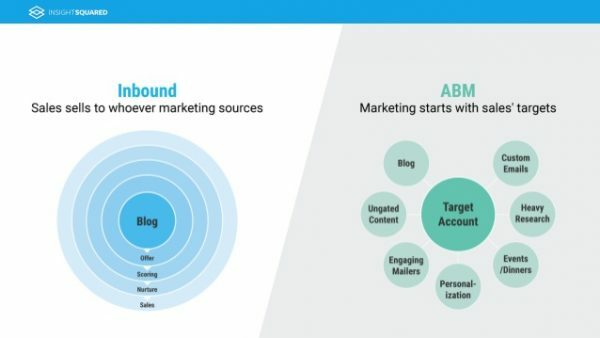 Brands should use content marketing AND account-based marketing (ABM). “Our job (as marketers) is to grow our business,” he says. By carving segments from your larger target audience and subdividing those into various cohorts (i.e., accounts with common attributes), you can create smaller highly targeted customized campaigns – flipping the sales funnel upside down. “Yields will be at least or greater to the wide-mouth funnel approach that is content marketing,” Joe says. “Show how I’m measured and I’ll show you how I’ll behave,” Joe says. If marketing success is measured by the quantity of marketing-qualified leads produced, the bar to create such a lead will be set as low as possible. Marketers will do what they think will produce the biggest numbers, not necessarily the best leads. MQLs transfer the problem to the sales team. “(You’re) giving them junk,” Joe says. Content marketers publish a blog post, wait for the audience to find it, and expect some readers to dig deep enough to fill out a form with their valuable contact information. Plus, just because a person fills out a form to acquire valuable content does not mean she is interested in sales or even the brand. Yet, the person is an MQL and the burden is moved to sales. “It’s not efficient. Waiting isn’t the strategy and yet content marketing relies on some waiting,” Joe says. ABM is a proactive approach – reaching out to prospects and customers. 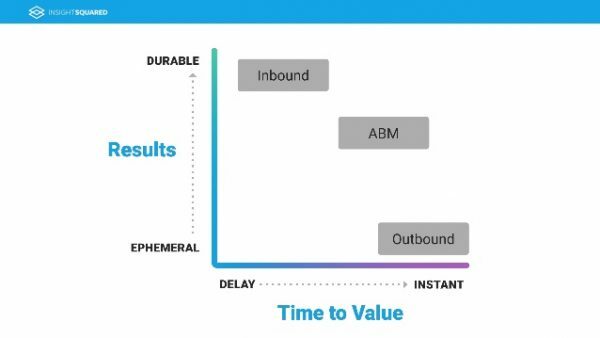 While content marketing follows a sequential or linear process (blog, offer, lead scoring on conversion, lead nurturing, hand-off to sales), ABM is lumpy. You target an account or a basket of accounts and pick and choose ways to engage them (a blog post, ungated content, personalized email, event, or dinner). ABM complements content marketing and vice versa. As Joe says, marketers must find ways to stitch together the two methodologies because accomplishing your ultimate goals requires both. Fortunately, the values for content marketing and ABM are the same – to make your customer’s life better. 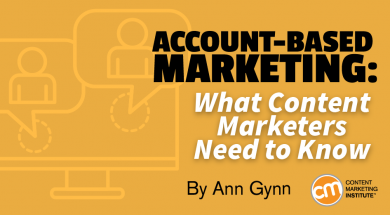 Content marketers shouldn’t be threatened that ABM will take away the need for content in their companies. In fact, the opposite may be true. Demands for content – lots of little content, original, and customized – for each account or cohort will be needed. ABM also presents a more effective primary content distribution channel – the sales team. “None of this works if the sales team isn’t using your content,” Joe says. Finally, marketing still needs a way to engage people the first time. That usually occurs on a widely targeted basis and content is an effective way to attract those new people. “You have the opportunity to take everything learned in content marketing and apply it to a new methodology,” Joe says. Think content-marketing strategy applied to direct mail. Joe shares a couple inspirational successes from InsightSquared. In the first example, InsightSquared’s sales reps each picked five accounts to receive a case of InsightSquared-branded energy drinks. 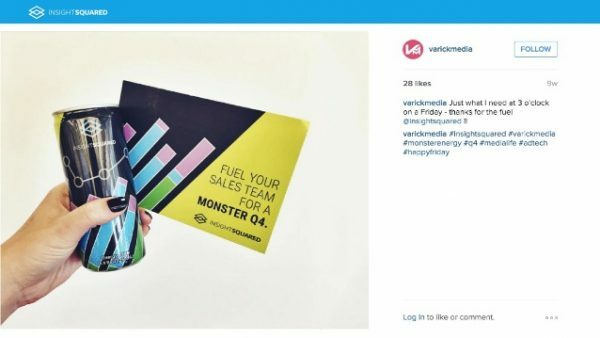 It included the message, “Fuel your sales team for a monster Q4.” The results were great – recipients were 30 to 40% more likely to buy than those who did not get the drinks. The second example incorporates individual account-based data. The InsightSquared marketing team uses that data to identify someone who is stuck in the sales process. 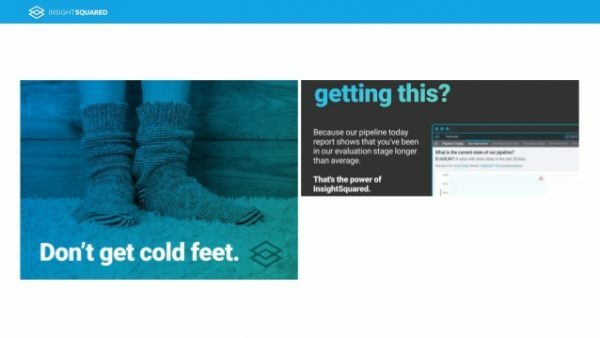 When it sees a hesitant account, it confirms the status with the sales rep. Then, marketing mails a pair of socks and a postcard with the message, “Don’t get cold feet.” It explains why the company is sending it and invites the recipient back into the active sales process. But, he says, many companies do have to distinguish whether they’re selling to Mack the truck driver or Mack Trucks. They know exactly who their customer is – and it isn’t the masses. Combining content marketing and ABM requires marketing’s goals to align with the sales team. You must work toward what’s best for the business as a whole. No longer is success driven by how many companies you connect with, it’s about the number of highly responsive and interested companies you connect with. Metrics focused on the size of the audience are backward in an ABM-focused environment. As Joe explains, if your blog audience numbers stay flat month over month but the composition of the audience includes more designated accounts, that’s a marketing success. Your measurement framework must be sales-centric. In an ABM-included world, the content team gets a new center of gravity. Instead of a blog with content for a broad audience, content creators can narrow the aperture of what they write to be for a very specific audience. The alignment also enables the content team to plan its editorial calendar in tandem with the sales team’s themes. What insights and ideas will this year’s Content Marketing World presenters share? Make sure you’re there to hear them. Register today for the Sept. 5-8 event. Use the code BLOG100 to save even more on early-bird rates.